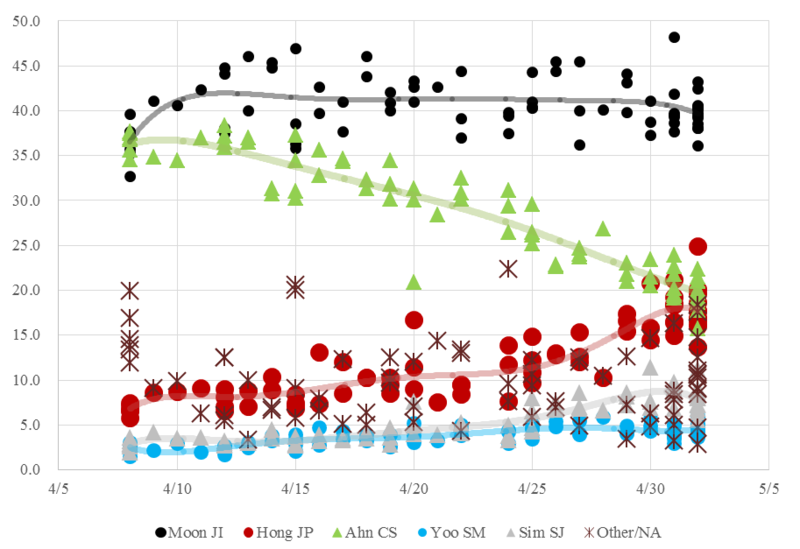 With only a day to go till the South Korean presidential election, we take look at the latest polling results collected by multiple survey outlets up to May 2. Data is posted by the National Election Commission.1 Polling is prohibited by law during May 3~9. 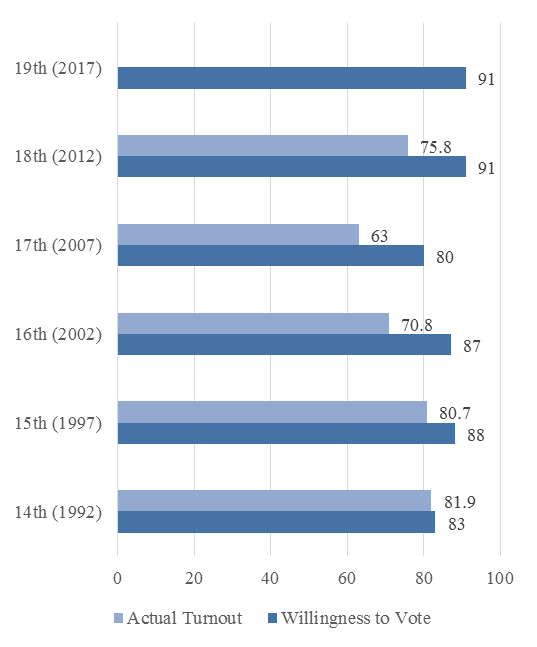 The data shows consistency in support for Moon Jae-in of the Together Democratic Party (TDP). The poll of polls average support for Moon is about 40%. Hong Jun-pyo of the Liberty Korea Party (LKP) has surpassed Ahn Chel-soo during late April and early May with average support at approximately 20%. Ahn Chel-soo of the People’s Party (PP) is close behind at about 18% but his trend is negative. Sim Sang-jung of the Justice Party (JP) is also making a late push with about 8% support but Yoo Seong-min of the Righteous Party (RP) is holding steady at about 5%. As it stands, Moon is in the clear lead by about 20%p from the nearest contender (Hong). This year’s voter turnout is expected to be high. The number of returns on overseas ballot is 221,981. The turnout was quite high (75.3%) for the Korean nationals in 116 countries turning out to vote during April 25~30.2 Early voting, which took place during May 4~5 was also quite high with 11,072,310 voters turning out (26.06%) to cast their votes.3 Comparison of the data on “the willingness to vote” and actual voting suggests that voter turnout is likely to match the level of the last presidential election (75.8%). “‘저 투표했어요!’ SNS에 재외투표 인증 행렬…투표자 ‘역대 최다’,” 조선일보, 2017년 5월 3일. “19대 대선 사전투표율 26.06% 최고치 기록,” 한겨레, 2017년 5월 5일. Gallup Korea, Daily Opinion (No. 257); polls from the 14th presidential election was taken 5 weeks before election; 17th was taken 1.5 weeks before the election; 15th~16th and 18th~19th was taken one week before the election. “칼빈슨호 동해 온 날, 航母 잡는 미사일 쏜 북한,” 조선일보, 2017년 5월 1일. “북한, 이달 들어 3번째 탄도미사일 발사했으나 공중폭발,” 한겨레, 2017년 4월 29일.